The Hollywood Reporter – er… reports that director Duncan Jones, late of “Moon” and “Source Code” has landed the hypothetically coveted job of helming Legendary Pictures “Warcraft” movie; which is apparently still happening despite the property’s pop-culture ubiquity seeming to have peaked a couple of years ago. Good news for Jones, in any case, whose worked hard and definitely deserves the cache that’ll come from helming a likely-successful blockbuster; but forgive me if I’m not jumping over the moon. I’m just not really seeing what a “Warcraft” movie can realistically offer beyond being a “LOTR” riff with a more D&D-inspired aesthetic. Fodder to make a good movie, certainly (particularly with a great filmmaker onboard) but “Warcraft” is more beloved for its gameplay and depth/granulaity – not its story or even really its visuals. Honestly? THIS is the franchise I’d like to see jump in front of the “ordinary person zapped into gameworld” bullet that you ONE game-adaptation is going to have to take at some point. Let’s get real: The ONLY reason “Warcraft” is worth spending $100 million+ on making a movie is because “WORLD OF Warcraft” blew up into a huge mainstream phenomenon – hence why that one “South Park” episode is probably the best narrative thing ever associated with the franchise – and it did so because of the “take a break from work/life and ADVENTURE!” aspect of the MMO. If your trying to put the “Warcraft Experience” onscreen… that’s kinda IT in my estimation. So… I generally avoid using the Blog(s) for things like this, but wide nets need to be wide. I’m looking to get in touch with people in the book-publishing business, specifically video-gaming related stuff but really at this level any inroad would be a good inroad; but there’s a pretty wide disconnect between the digital press world and the print world, so… don’t really have any idea how to do that. Head’s up: I’ll be introducing an evening (6:30pm EST) screening of “The Avengers” on Saturday (Feb. 2nd) at the Brattle Theater in Cambridge, MA. More details on the screening, part of The Brattle’s 2012 Best Of series, can be found on their website. (UPDATE!) Also: I can also proudly announce that I’ll be a guest at SGC 2013, June 21 – 23 at the Hyatt Regency Dallas in Dallas, TX. Big Picture: "A Disturbance In The Force"
The producers of the “Evil Dead” remake would like you to know you can go to this website and record yourself being freaked-out by the recent trailer. So… yeah, that’s a thing. Is Paul Giamatti ‘The Rhino’ for "Amazing Spider-Man 2?" I maintain that I haven’t been unfair to “The Amazing Spider-Man.” It was a bad film with an infuriating production history, and I covered both aspects as such – nothing more, nothing less. I’ve also continuously maintained that if the production of ASM2 made any moves that I thought sounded good, I’d say so. THIS, then, I will say makes me cautiously optimistic: THR reports that Paul Giamatti is being sought for “The Rhino.” That’s more like it – maybe. Understand – I don’t know that this signals anything having been corrected in the myriad flaws that are just built into the DNA of this rebooted franchise: Garfield’s miscasting, Webb is simply not good at directing action, the “new” backstory (even assuming they just junk the non-starter missing-parents stuff) doesn’t work, etc. There’s not much to indicate that any of that is going to get ironed out. BUT! …I love The Rhino. 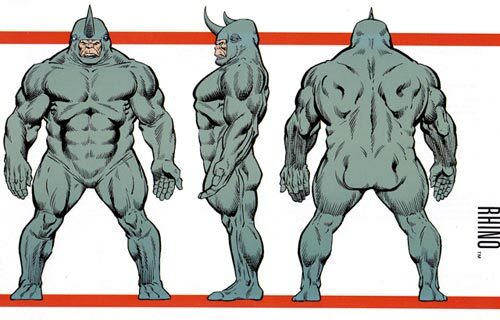 I love everything about The Rhino, from the simplicity of his name and costume (yes I know it’s technically supposed to be some kind of high-tech body-armor skin-graft but it LOOKS like a costume) to the basis of his existance: It’s a superhero story, visual dynamism is a premium, so why have just a muscleman when it can be a muscleman dressed as a rhinocerous? And Giamatti is a great actor who’s often at his most enjoyable when he goes waaaaay over-the-top in villain roles; so he could be a lot of fun here. Two kinds of people in the world: Thinkers and Believers. You know where these guys line up. And please bear in mind – there are millions of people who line up right next to them… and they’re all allowed to vote. Pleasant nightmares. If you’re the guy who thought “In Time” was too blunt about it’s scifi-conceit-as-metaphor-for-classism angle, “Upside Down” is probably going to give you an anuerysm. See also: The guy who’s angry about “Looper” being more interested in the plot/characters turns that could come from it’s scenario than it was about explaining how it’s time-travel worked.